Note that trading in your Mbox may not be for everybody. The original Mbox is an excellent mobile interface and since Pro Tools LE only runs with hardware plugged into it, you probably don’t want to be tied exclusively to an 002. If you’re happy with your Mbox, you can upgrade to Pro Tools 7. 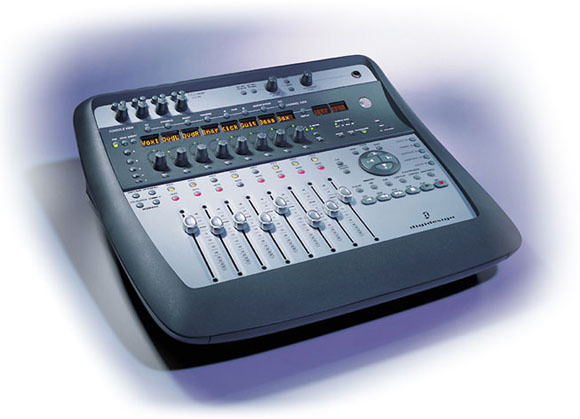 Digidesign also now lets you install M-Powered on the same machine as LE, so I think a smarter upgrade for some might be to switch to Pro Tools M-Powered and have your choice of M-Audio interfaces. You will want this, though, if you’ve got an 001, because unlike the Mbox, the 001 doesn’t support Pro Tools 7 — meaning it also won’t be supported on Intel Macs. And the 002 Factory with its integrated control surface (shown) is a pretty nice piece of kit. As for whether the Music Production Kit is a great deal, that really depends on your needs. If you really love Pro Tools, getting some extra synths and effects in the deal could be terrific, and these are all top-notch offerings. For those of us on other platforms, though, it’s hard to get excited: compare the multitude of excellent synths and effects in either Apple Logic Pro 7 or Cakewalk SONAR Producer Edition to the grab bag offerings of the music production kit, keeping in mind that these packages don’t tie you down to one vendor’s hardware. Then again, I’m not sure that’s the point. We’re at a generation in DAWs where it’s more about slowly growing your user base and keeping loyal users happy than it is about wooing large numbers from other platforms. (Or, at least, that appears to be the net result.) So, I say, developers, keep on spoiling us. Really. Now, if only some keyboard vendors would start taking trade-ins on those . . .